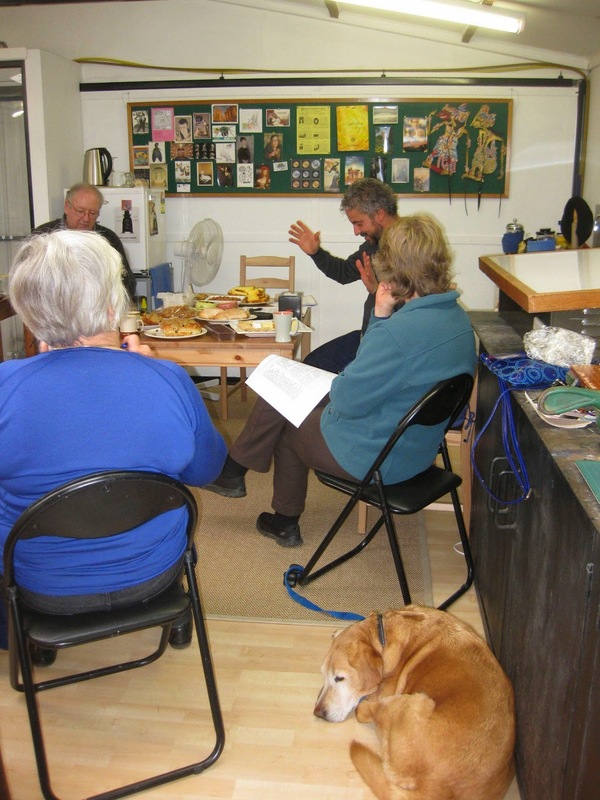 On Saturday morning (July 26) Goldfields Printmakers, of which I’m a member, held their latest meeting at my Ballarat studio. The Agenda, drawn up by the group’s founder, President and driving force, Jimmy Pasakos was, as always, an extremely full one, detailing projects stretching well into 2016, including a planned submission for the international printmaking conference, IMPACT 9, to be held in China in 2015. (In 2013 Jimmy presented a selection of our work at IMPACT 8, hosted by the University of Dundee in Scotland; the work was also exhibited at the Art Gallery of Ballarat and Wharepuke Print Studio, New Zealand during the same year). Next on the list for Goldfield Printmakers is our eponymous group exhibition at Firestation Print Studio, Prahran, which opens on 4 October. Full details will be posted nearer the time. 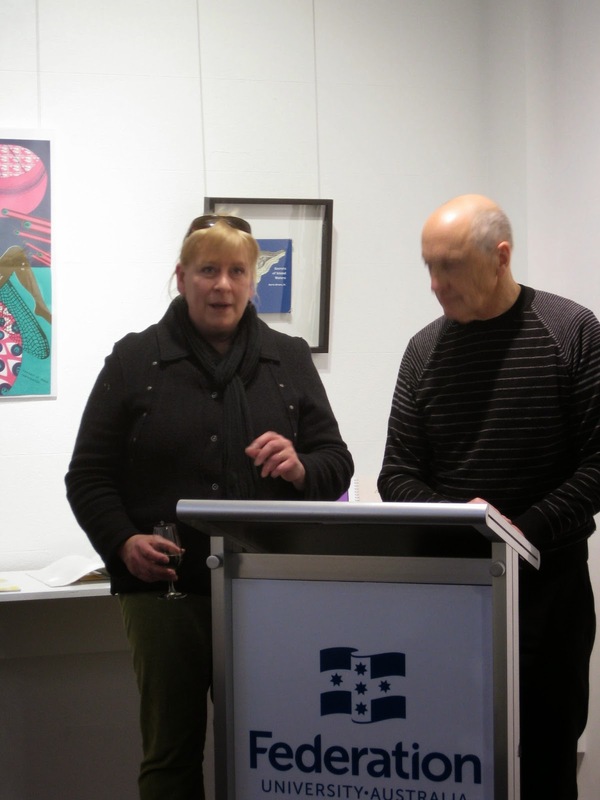 Castlemaine-based Catherine Pilgrim, a superb lithographer and an old friend, is the latest inductee to the group. It’s great to have her on board. This week has been an especially busy one, which began with a real treat. On Monday morning, July 21, Gillian Nix and her colleague Marion Power brought along their Year 11 printmaking students from Huntingtower School, Melbourne for a visit. 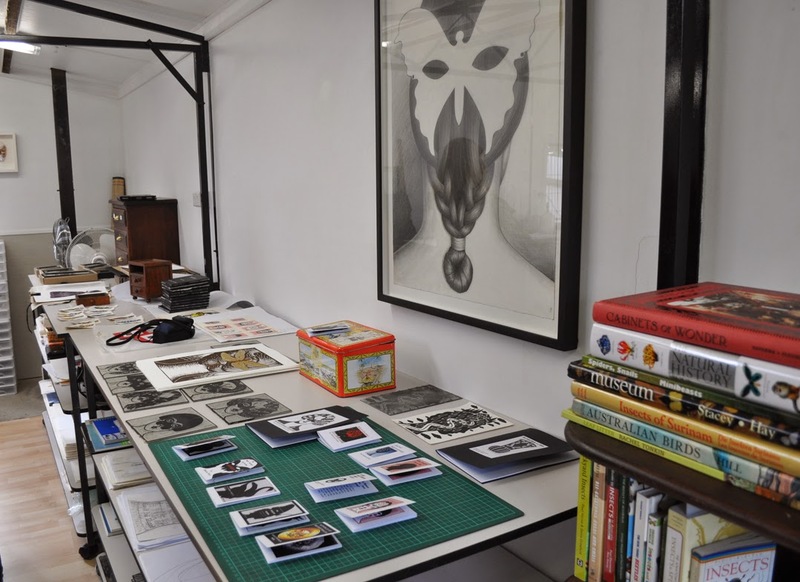 We have had very few visitors to our relatively new studio in Ballarat; I very much enjoyed meeting everyone, sharing a selection of recent and current work and talking a little about the ideas and influences that direct it. I was delighted that the students also brought along their work books. It was a privilege to hear about their own ideas, see them expressed through their research and exciting to see the linocuts that resulted from this. I'm really looking forward to seeing what they come up with next. Some of my recent works on paper and current lino blocks, along with a selection of reference books. Photograph by Marion Power. This exhibition spotlights Arts Centre Melbourne's nationally significant art collection. The creative intersections between contemporary art and performance are explored in recent works of art inspired by dance, music, opera, theatre and circus. Artists include: Charles Blackman, Inge King, Colin Lanceley, John Olsen, Jon Campbell, Robert Jacks, Vernon Ah Kee, Robert Owen, Wendy Sharpe, Charles Blackman, Inge King, Colin Lanceley, John Olsen and many others. 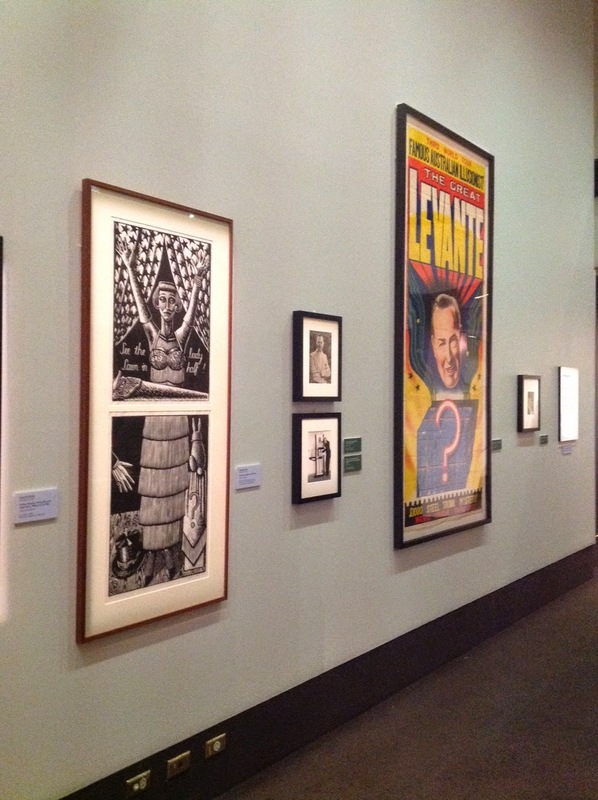 The exhibition also showcases some of the portraits and personalities represented in Arts Centre Melbourne’s collections. Celebrated performers include opera diva, Dame Nellie Melba; visionary ballet founder, Edouard Borovansky, and dancer, Marilyn Jones; theatrical maestro, Barry Humphries; and singer-songwriter, Nick Cave. My linocut See the Lady Sawn in Half! 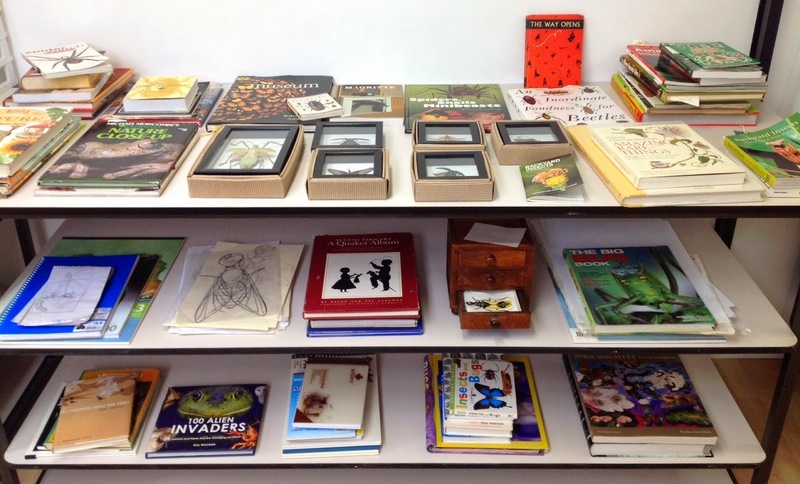 shares a long wall - a kind of sideshow alley - with some marvellous works by Fred Williams, Anne Zahalka, Polixeni Papapetrou - and, to my immense delight, Australia's legendary illusionist The Great Levante. and The Great Levante theatrical poster. Since my early childhood the performing arts in every shape and form have been constant sources of inspiration; some of my heroes are represented in this show. Over the years I've been to countless productions at the Arts Centre (in fact, just last night Shane and I attended Victorian Opera's stunning production of Stephen Sondheim's Into the Woods). I’ve also delighted in the many and varied exhibitions presented there. I’m still pinching myself in disbelief that my linocut is part of this one. Never before has a work of mine seemed so completely at home. SHOW TIME, Gallery 1, The Arts Centre, St Kilda Road, Melbourne opened on 12 July and runs until 21 September. Since returning from the UK most of my studio time has been taken with finishing or continuing existing projects. I now realise this was fine, because at least I was able to retain a vital connection with the work as I considered its future direction. Once in a while I reach a major crossroads. This has been one of those times, however I don't ever recall feeling such degrees of anxiety and uncertainty about which way to proceed. I haven't been experiencing an artist block; rather I've been faced with the conundrum of having too many potential paths from which to choose. Pursuing all of them would require at least six clones of me and could also result in fragmentary, scattered imagery, rather than a strong, cohesive body of work. Finally, I had an extended brainstorming session in the studio, which basically involved setting out many of the dozens of references I've accumulated over the past several years. For the first couple of days the studio looked like a bomb site. I took heart from the title of one of the books, which I hoped would be prophetic: The Way Opens. 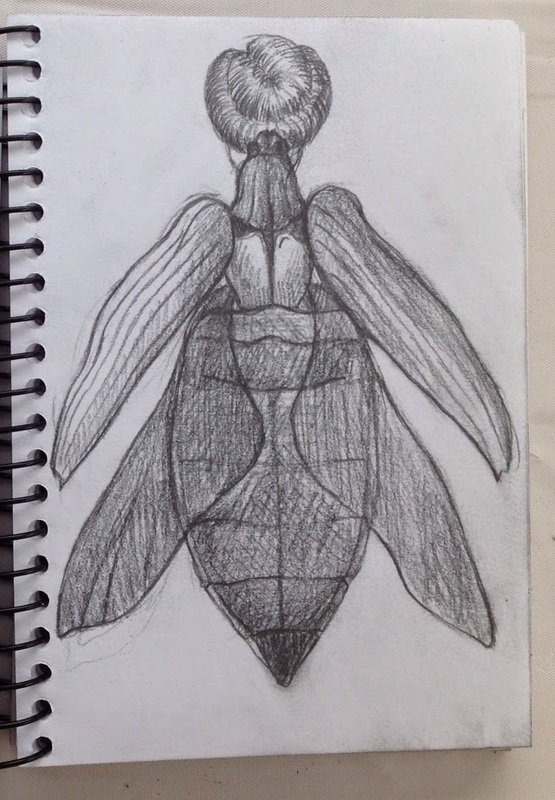 From chaos, which I can tolerate for just so long, came the decision that for now I will pick up some of the threads from the Myth-entomology series. 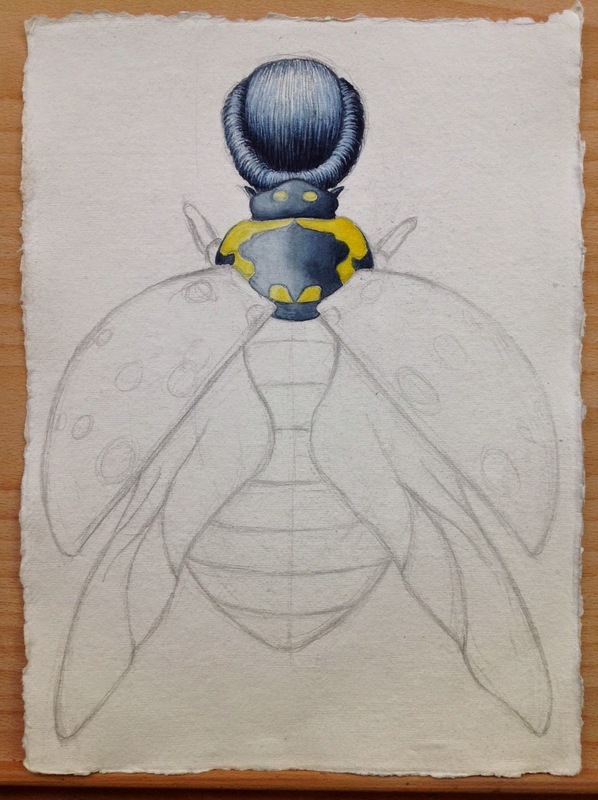 Although I'm still locked into several printmaking projects (including the artist book Homo-insecta, recently shortlisted for the Fremantle Arts Centre Print Award) I will concentrate on developing the watercolours that began life with the tiny Cabinet of Insect Women, 2012. 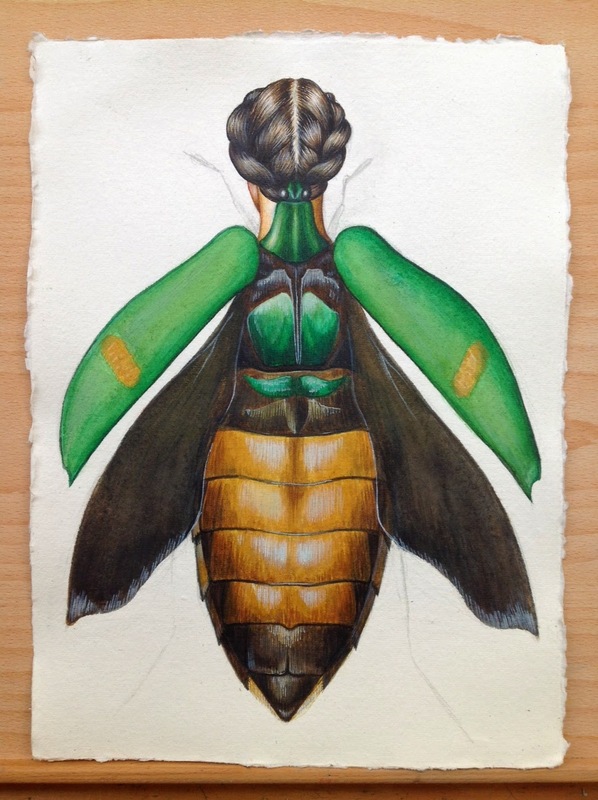 It had always been my intention to gradually increase the scale of the homo-insecta watercolours with a view to extend the work technically and conceptually. 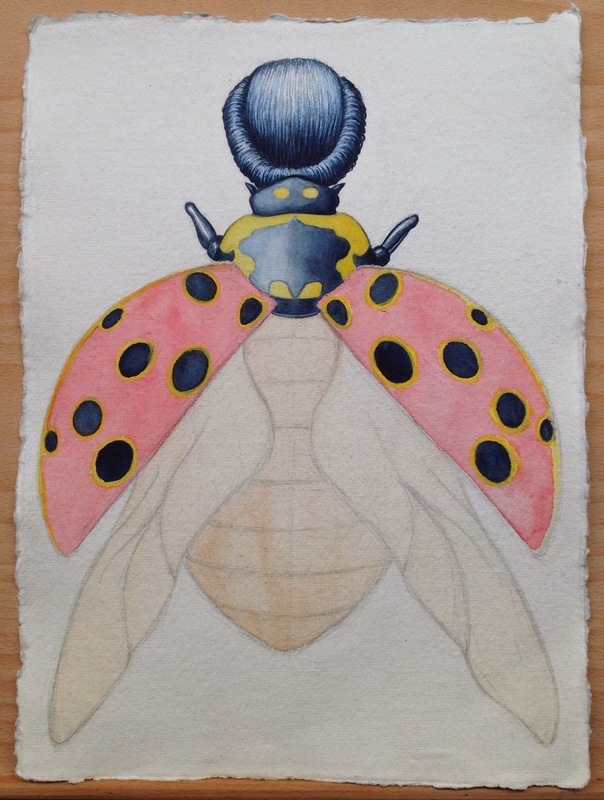 A Cabinet of Insect Women, 2012, miniature plan cabinet with 30 watercolours on Khadi paper, each 10.5 x 7.5 cm. 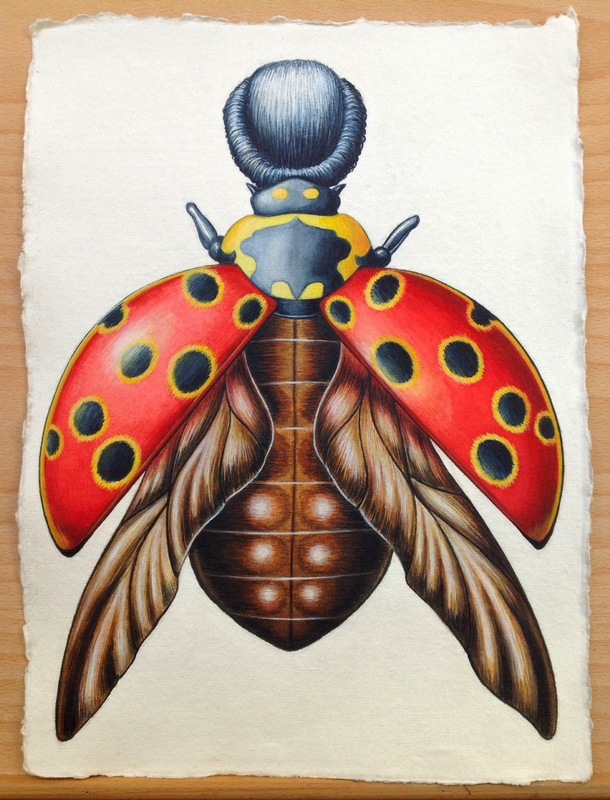 Fierce storms were raging as I laboured to breathe colour and life into the first of these, Catoxantha opulenta beetle woman. I couldn't help but recall the eponymous doctor in the film version of Mary Shelley's Frankenstein (d. James Whale, 1931) who brings his own composite creature to life during a thunderstorm. 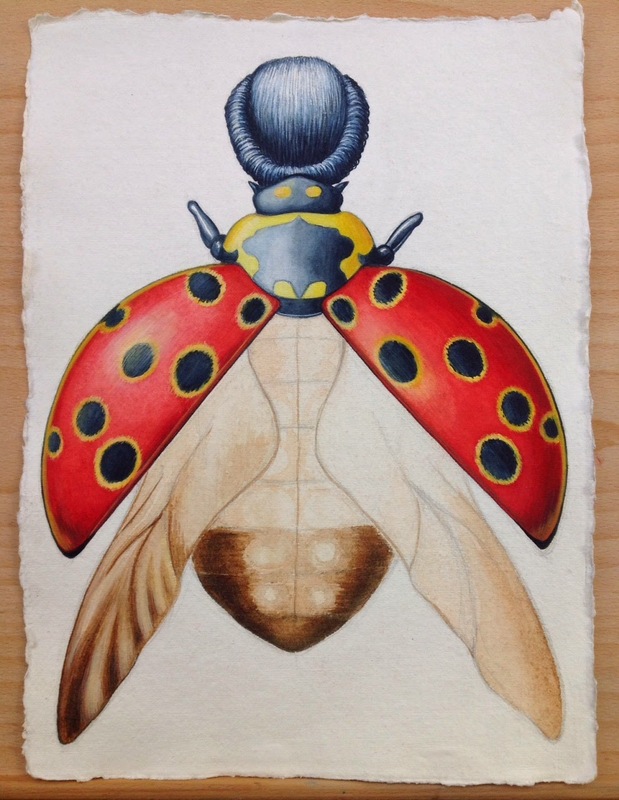 As noted in my previous post, the natural history illustrations of Maria Sybilla Merian are a key influence - even more so since recently studying her work in the British Museum. 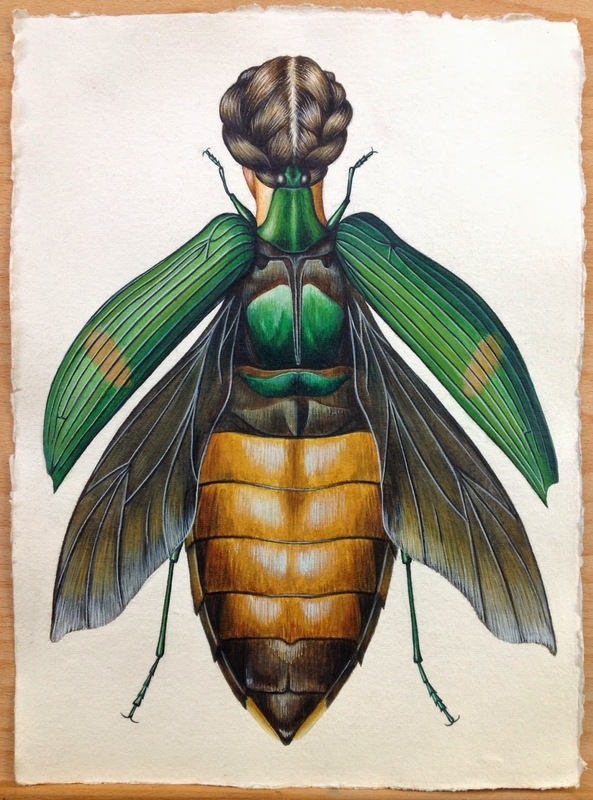 The vibrant colours and rich, painterly surfaces of her watercolours on vellum particularly struck me - doubtless a reflection of the exotic Surinamese flora and fauna that were the subjects of her most renowned works. 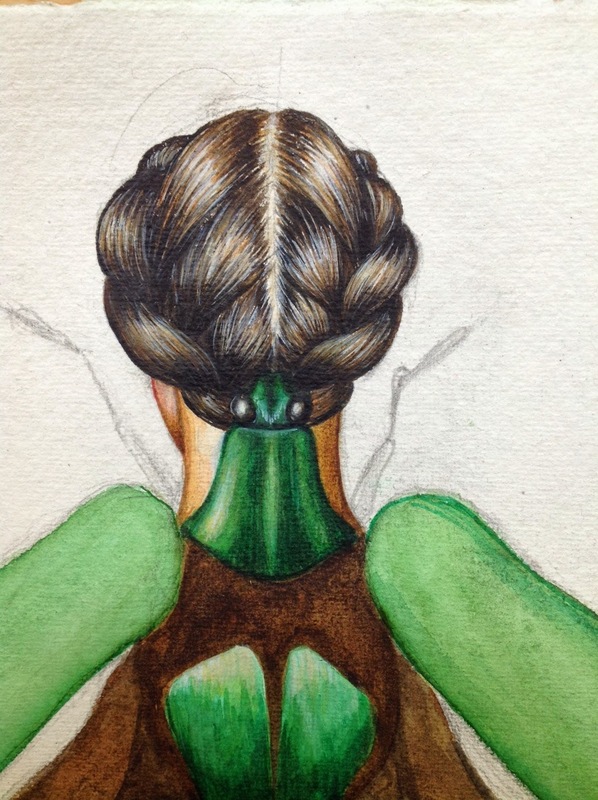 Even as I wielded my brush, I was increasingly aware of how much seeing her work in the flesh has emboldened my watercolour technique. 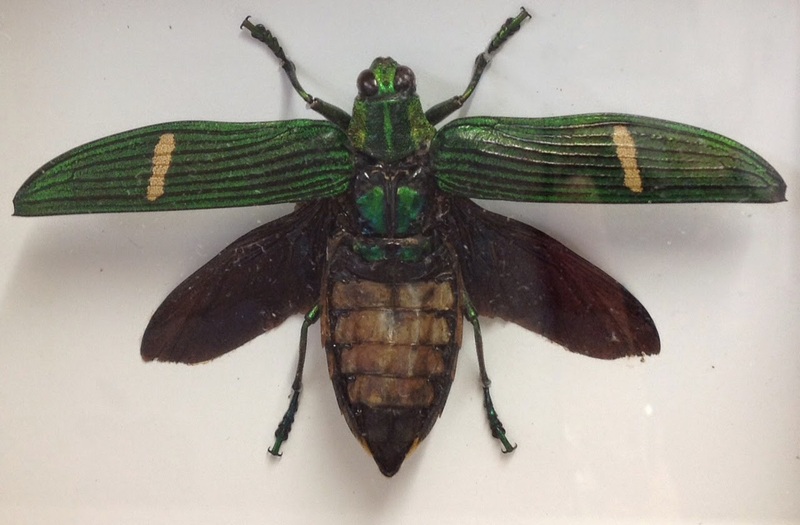 I worked in part from one of the insect specimens I acquired earlier this year at Melbourne Museum. The working drawing directly below it is one of several I made when mapping out ideas for the linocut I produced as special guest artist at the Australian Print Workshop back in January. All of this makes me suspect I was already on my chosen path and had merely wandered from it.